There was a time when extreme music was not a mere shouting exercise, but a VISION, an idea of how to develop the magma of creation. 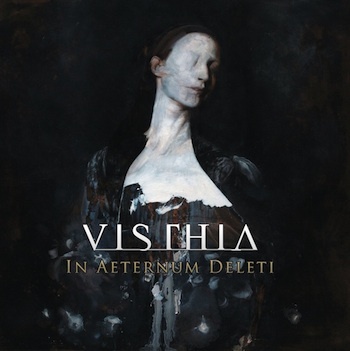 Hailing from Italy, Visthia confirm the innovative attitude and contribution this scene is giving to reawakening the daring attitude that scene seems to have lost. After so many years of loud madness, can we convey metal and industrial noise experiences into a new synthesis? A proud metal strength, moving the step from the ancient cults – can it be synthesized by machines? Where others merely stopped to investigate, Visthia crossed the Rubicon, passing through the most extreme metal hemispheres to the industrial fields, resulting in a new genre: Black Powernoise. Told through the Latin tongue, the Occult Tradition becomes untold. The platter is enriched by the contribution of the internationally renowned artist Nicola Samorì, known for his unique style, bringing modern decay into the crystalized perfection of the ancient. For fans of Dødheimsgard, Diabolicum, MZ.412 and Aborym‘s “Kali Yuga Bizarre” era.